I went to lunch at Guida’s (now officially called New Guida’s) towards the tail-end of an all-day weekday CTMQ day. I was pretty worn out but also pretty darn hungry. 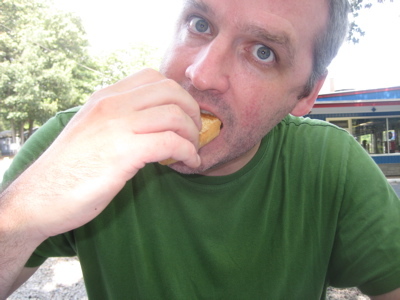 I was actually excited for my 10-inch hot dog. Guida’s is one of the rare Roadfood “Eat Before You Die” joints that I didn’t need a map to find. 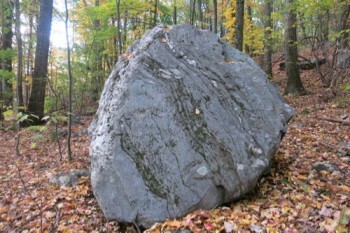 That’s because it happens to lie right on the Mattabesett Trail in Middlefield (CTMQ’s hike here) which is a definite treat for hikers who end a section here. They have great ice cream as well. 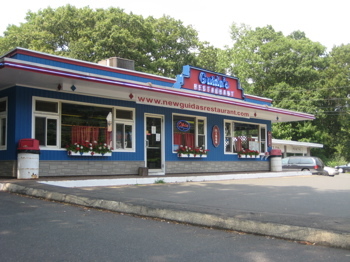 Guida’s was established in 1946 as a tiny seasonal road side hot dog stand. In 1953, the late Bill Guida purchased the tiny stand with the surrounding property. As the taste for his 10″ hot dogs grew in popularity, he then decided to build this restaurant in 1957. Eh, maybe they’re actively trying to repel hipsters and artisanal mommies. Other than an exterior face lift and some fresh neon signage, we’re not sure what exactly is new about the restaurant that calls itself New Guida’s. The hot dogs taste like the same excellent ten-inchers we’ve been enjoying at this happy-go-lucky drive-in for a few decades now. They are slim, taut franks in a natural casing tied with a rough (but oh-so-charming knot) at one end. 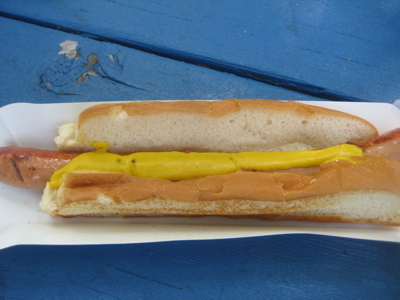 Cooked on Guida’s grill until they develop a mottled, crackling skin, the hot dogs are bedded in beautiful split-buns that have been brushed with butter and toasted crisp right next to the dogs. The package is a beautiful thing. This is a hot dog so tasty that we actually sometimes get it plain, just to savor the simple, perfect combination of high-flavored frank and butter-mellow bun. But of course there is a full roster of available condiments: ketchup, three kinds of mustard plus mustard relish, sweet relish, hot relish, fried onions, fried peppers, and cheese. 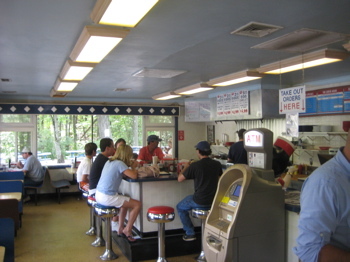 Guida’s is a nice stop for a quick breakfast at the counter (with a view of the grill); and there is a lunch menu beyond hot dogs that includes fried clam strips, hamburgers, and assorted sandwiches. We are fond of the ice cream Guida’s serves, too, especially the post-modern flavor combo of peanut butter cups and chocolate in vanilla, known as moose tracks. But it’s those fine ten-inch hot dogs that will always keep us coming back. I have long held a strange affinity for the restaurants and businesses that are situated right along the Appalachian Trail. It doesn’t really make much sense, but I can’t help it. There are a few commercial businesses along the Mattabesett/Metacomet’s length, but Guida’s stands out. I wouldn’t feel terrible about getting food here after a long, hot and sweaty hike. 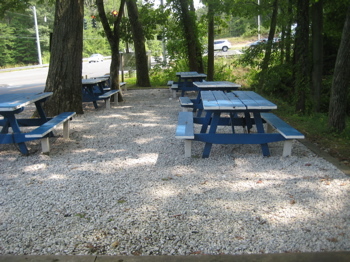 Mostly because there are picnic tables to eat at literally right on the trail! I love that. I ordered my Roadfood prescribed 10-incher and waited maybe 7 minutes for it to fry up on the grill right in front of my face. 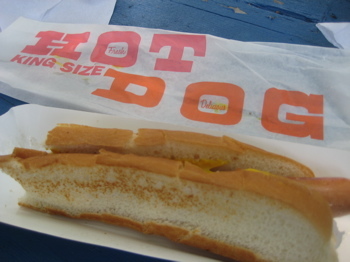 As much as I want to hate them, I still really like a good hot dog. (For those of you who know, I actually don’t any animals on the hoof except to complete this particular list for CTMQ.) I love the snap of the skin, the char of the grill and quite frankly, the singular hot doggy taste. Guida’s dogs are excellent. I usually am not a fan of this New England “split bread” thing they serve hot dogs on, but when it’s buttered and grilled for a few minutes, their use becomes very clear. With so many hot dogs on this list, I’m in no position to declare an overall winner yet – but Guida’s will be up there I’m sure. Frankie’s in Waterbury should be next on your list. Terrific hot dogs. This is great, still open!! 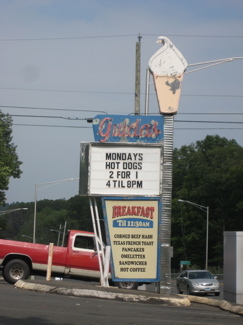 Grew up in middlefield 55+ years ago and we went to Guida’s all the time for those great hot dogs and milk shakes! Plan on being there in two days after all these years and I will definately stop for a dog! Hopefully Bill Guida Jr. is running the place. The name was change to “The New Guidas” when Lou Seria purchased it. He is still the owner. Must be close to 20 yrs now.